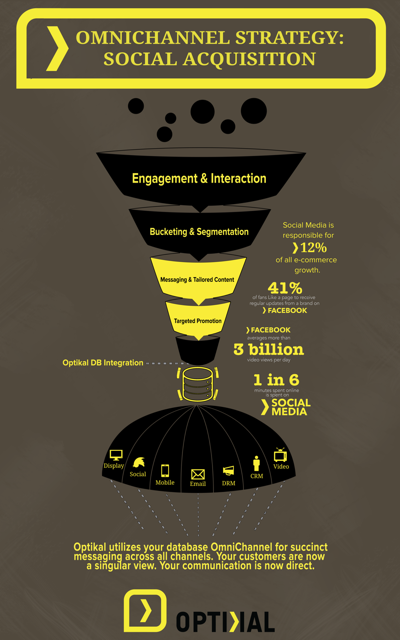 Did you know Social Media can be used as an acquisition funnel? A well executed strategy with a mix of native ads, content, and “like/follower” campaigns can be used to drive leads across Social Media. It’s the fastest growing digital commerce platform, increasing in sales by over $4 billion from last year. Pioneers have figured out how to use Social Media and other digital advertising to acquire quality leads. Optikal offers a key implementation, including a comprehensive review, campaign execution, data modeling, and analytics across the platform. Our unique approach with data integration allows us to create sales leads from basic information. This means less work for your consumer and more information for your campaigns. All consultation and creative strategy is a must for an effective campaign. With Optikal, businesses receive a comprehensive overview, reporting, integration, and a skilled ad creation team. This compilation of skills and assets allows us to produce tailored campaigns and exceed client expectations.